Lucille Ball, the iconic redhead that everyone knows and loves from I Love Lucy never seems to go out of style. The show, which is still featured on TV and immortalized in DVD box sets can still make just about anyone chuckle. Lucy and Ricky are quoted and referenced throughout popular culture and it can be argued that the show is the archetype for all situation comedies that came thereafter. The stars truly made the show shine. Lucy and her pal’s high jinks are simply classic TV that is still relocatable today. That is probably why I Love Lucy gifts are still a great way to show someone you care about them. 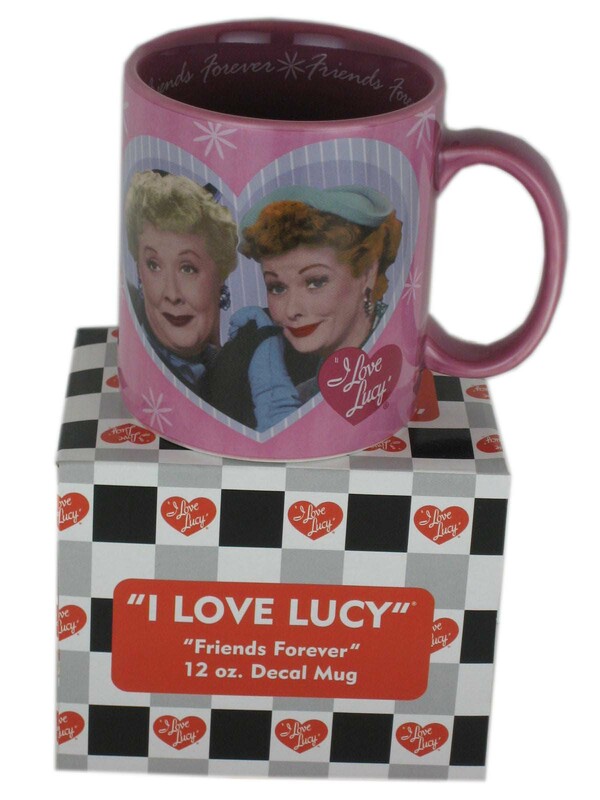 I Love Lucy mugs remain a top seller in the shopping category of mugs and TV memorabilia. Frankly, everyone needs a good picture of that hilarious redhead with their cup of Java in the morning or with their tea at night; whichever your preference. While I Love Lucy mugs are hot sellers year round, there are a ton of I Love Lucy gifts that any I Love Lucy Fan would be happy to get. Each piece of Lucy memorabilia on the market usually has a classic scene depicted on it. Many I Love Lucy mugs feature Lucy, and her gal pal Ethel, in some sort of hilarious predicament. Everyone has a different scene that they love the most; but most people rank Lucy and Ethel working the candy factory amongst their favorites. Other people fell in love with Lucy’s drunken commercial for “Vita-meta-vega-min”. Whatever scene you or a friend loves there is usually memorabilia for it. There are also mugs that feature Lucy with her, fabulous, famous husband Ricky; the stoic Cuban who simply doesn’t understand how Lucy gets herself so involved in shenanigans. Lucille Ball and her co-stars created a show, for years that had people rolling on the ground laughing. That type of comedy is hard to come by these days, which is probably why the show and presents relating to Lucy are still so popular today. Either way, the reasons don’t matter; the only thing that matters is that Lucy, Ricky, Ethel and Fred products are still readily available for the public to consume. A rabid Lucy fan will likely drool over any piece of merchandise that features that famous redhead, so picking up a Lucy piece makes perfect sense for anyone who loves the show. There is likely an I Love Lucy fan amongst your group of friends. There is always at least one Lucy fan in every group. Think about which one of your friends is a fan of classic TV and consider an I Love Lucy theme for their next birthday gift. Maybe the person you need a birthday gift for is a friend like Lucy was to Ethel who could use some classic TV in their life. Whatever the situation is there is a Lucy gift out there that will certainly do the trick. Consider giving the gift of classic TV memorabilia next time you need to purchase a present. Reaching the age of 70 is a milestone. Someone this age is well into his or her senior years, but still may not be considered elderly. Those who know someone who is about to reach this age may wonder what to give as a 70th birthday gift. Someone who is turning 70 may not expect a wild birthday party. However, there are many dignified ways of celebrating this special birthday. One way is to present the celebrant with one of a variety of candy baskets. Marking the year of the person's birth, a 1942 Nostalgic Candy Box features items he or she may remember as a child. These include Satellite Wafers, Chiclets and cigar-shaped bubble gum. 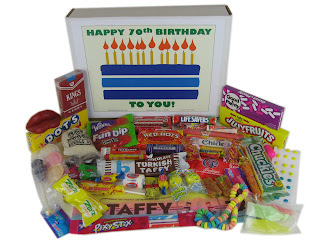 A box of Retro Candy is another memorable 70th birthday gift. Among the fun contents of these gift baskets are Boston Baked Beans and Wax Lips. A 70th Birthday Gift Celebration basket of candy is also filled with items from the past, including candy cigarettes and Turkish Taffy. Celebrating the decade in which the person was born is a "Candy Memories from the 40s" box. Its contents include Sugar Daddy, Tootsie Roll and Bit-O-Honey candies, Red Hots and a candied necklace. Another gift idea that may bring back memories from the past is a retro nostalgic basket, which features SweeTarts and Lifesavers. Gift baskets of the 70th Birthday Celebration Junior variety contain 30 types of candies that should bring any septuagenarian back to his or her youth, including Chuckles, pumpkin seeds and an old licorice pipe. As a reminder that someone turning 70 is getting up there, the "Over the Hill Birthday Box" not only comes with candies but such toys as Silly Putty a Chinese Yo Yo. A pair of Happy Birthday 70th glasses will remind everyone of the person's age, and a Chantilly Lane Singing Bear will make someone's birthday lovable by singing the birthday song. Wearing a birthday cake hat and sash, the bear has a flat bottom that allows it to sit upright. Birthday candy baskets can make for a festive day, but there are other ways to celebrate someone turning 70. Consider having a potluck luncheon and have the guests bring their favorite dishes. Another possibility is to put up decorations that are built around the theme of being 70. What celebrities are the same age? What events occurred the year the celebrant was born? Candy baskets can be fun for older adults, and so can banners and balloons. Another idea is to put together a scrapbook of mementos for the person. Those who want to celebrate out on the town can plan a get-together at everyone's favorite restaurant. Those in their 70s often need things that are practical, so make the birthday gift a warm blanket. Those who like gags may get a laugh when they receive an inflatable walker or a bottle of prune juice. Every birthday is special, but few are as special as the 70th. There are many ways to celebrate it, but one of the best ways is with birthday candy baskets. Is it any wonder why kids have loved him for over a half century? Like any child, he’s wildly imaginative, impulsive and his innocence lends him extreme confidence. He’s currently reading War and Peace, one word a day. And, as he is famous for, he loves to fantasize. He can be a vulture or a World War I flying ace. He can be a detective. He can ponder life’s greatest mysteries from the roof of his doghouse. Like kids, and like most of us adults, he prefers to live in the moment. The Snoopy bucket celebrates this great character. It’s a brightly colored blue and red weighing 11.2 ounces. It would make a great Snoopy gift. The small metal bucket has a sturdy handle. It’s light and convenient enough to be carried anywhere. It can be filled with favorite toys or stuffed with a light snack. It would be a great tool for playing at the beach or park. If you’re having a birthday party, these make great accessories and centerpieces. Fill them with multicolor tissue, cellophane or streamers and add little surprises, creating an unforgettable Snoopy bucket. A great birthday gift, the small metal bucket is sharply decorated with red stripes at the bottom and top and a blue background at its center. The words Everyone Brings Something to the Party runs across the bottom and top of the bucket. There is an image of the great beagle and his long time friend, Woodstock. Woodstock is offering the adored beagle a flower. It exemplifies the innocence that was and still is a Peanuts trademark. 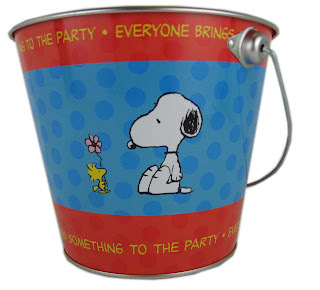 There is no Peanuts fan that wouldn’t find the Snoopy bucket to be an extraordinary birthday present. As a birthday gift, this small metal bucket can reinforce the innocence and determination that Charles Schulz hoped we’d all see in his wondrous characters. Even today, Snoopy continues to fuel the imagination. He challenges us to see beyond our boundaries and, sitting atop his doghouse typing the Great American Novel, he insists we pursue our dreams. These are ideals that should be freely encouraged in our children. Give this gift with a Peanuts compilation. If they haven’t yet, give a child an opportunity to learn about Charlie Brown and Snoopy, Linus and his blanket, Lucy, Pigpen and the other legendary characters that populate the Peanuts world. Bring a little something to the party. While fans of all ages could enjoy this, make a unique, colorful Snoopy gift to your child or grandchild. There’s no doubt as a birthday present, this will inspire a happy dance. There are several toys that can be considered American classics, and the Mr. Potato Head toy happens to be one of them. This particular item has a rich history and quite an impressive run along the popular selling lists throughout its career being made. Potato Head kids toys are common even today, available in almost any toy store and shopping center dealing in a wide selection of kids items. The simplicity of this toy is likely what makes it so appealing. This is basically just a plastic mold shaped into a potato with specifically placed holes throughout it. These holes fit the different pieces that will make up the face, with push pins to fit in the interchangeable holes on the potato. The set often includes a simple list of facial parts and items, including: eyes, ears, nose, mouth, a hat, and some shoes. These have been popular birthday gifts and Christmas presents since their release on Hasbro's product line in 1952. The idea itself was created a few years before this, and featured the push pin facial features intended to be used with actual potatoes and similar vegetables. However, this posed a couple of significant problems. Hasbro set out to remedy these issues before it would take on the idea of the Mr. Potato Head toy. The first of these issues was the real vegetables that were becoming toys. These would begin to spoil and rot, and parents found this horrible to keep up with and live with. The second issue played into the first and focused on new national safety regulations. With both of these in play, Hasbro decided to perfect the idea by creating a plastic potato body for the facial parts. Potato Head kids toys were everywhere once they first appeared in a television commercial. Kids all over the planet wanted them for their upcoming Christmas and birthday gifts. Soon the famous Potato Head had a mate in Mrs. Potato Head. She came with her own set of exclusive accessories and girly items. Not only has this product never been taken out of production since it got started 60 years ago, but it has grown to superstar status at times. A good example of this would be the appearance of Mr. Potato Head and Mrs. 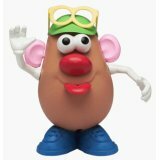 Potato Head in the Toy Story film franchise. This popularity has offered kids new body molds, themes, accessory packs and more to revive the fun in this simple yet educational toy. In 1964, TheBeatles literally burst onto America's rock music scene and they have remained one of the top selling artists ever since. The four guys from Liverpool, England made music history throughout the 1960's. Inspired by the likes of Elvis Presley and Little Richard, The Beatles gave us tunes such as "Please Please Me", "I Want to Hold Your Hand" and the ever popular hits, "Can't Buy Me Love" and "She Loves You". Yeah, yeah, yeah! Nicknamed "The Fab Four" by the critics, fans fell in love with them and have continued their love and devotion throughout the decades. Now you can continue your love and devotion for "The Fab Four" by picking up one of The Beatles coffee mugs. No matter what your favorite Beatles song, there's a coffee mug to accommodate it. From the famed animated "Yellow Submarine" themed coffee mug that beholds the song title "Love is All You Need" printed inside on a yellow background or signature Beatles coffee mugs that feature the faces of John, Paul, George and Ringo emblazoned with the "Help Design", the Beatles craze continues with coffee drinkers everywhere. A huge selection of Beatles coffee mugs are available to Beatle maniac’s around the world. If anyone you know is a huge Beatles fan, then the Beatles coffee mug would be the perfect gift. 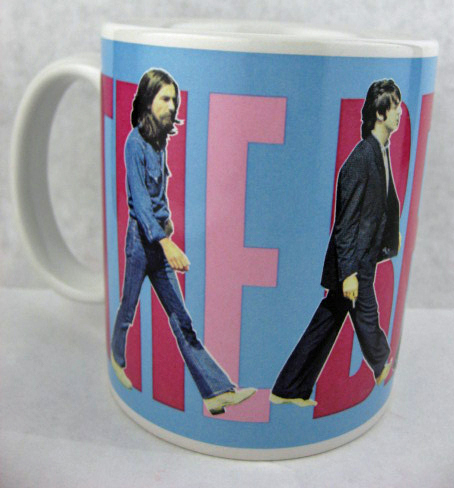 Give your Dad a Beatles mug for his birthday or Father's Day. This is a gift you can't go wrong with. Just as the band was inspired early on by American icons of early rock-n-roll music, numerous future artists were inspired by so many Beatles songs. Bands such as Pink Floyd, Radiohead and Oasis were obviously influenced by the famous quartet. Artists like Bono, of U2, Sting and David Bowie all credit "The Fab Four" for a lot of their creativity. The bands influence on American rock culture was certainly not limited to their song lyrics. Their insurmountable popularity reached out to their fans with a complete frenzy. Guys rushed to copy the "mop top", or the Beatle haircut. Others went so far as to duplicate the constant wearing of Edwardian collarless suits. Down to the tight fitting ankle boots, later affectionately called Beatle boots, fans couldn’t wait to acquire the four boys from Liverpool's fashion style. Sadly, over the years to come, the world lost two Beatles. Mark David Chapman murdered our beloved John Lennon in 1980 and we lost George Harrison to brain cancer in 2001. Gone but not forgotten, their accomplishments in the history of rock-n-roll music will live on in our hearts and ears forever. Every morning, while we drink our coffee from a Beatles coffee mug, we will be reminded of their legacy and our love for the band known as "The Fab Four".